We grow our elderberries from Canadian cultivar (Sambucus Canadensis) and they dont have a toxin (Sambunigrin) in them like in Europe (Sambucus Nigra). So, Yes you can eat our elderberry fresh and not cooked, we sell them at the orchard frozen by appointment and people love them and when we harvest they eat them fresh from the bush. Made in Canada harvested from our orchard. Certified Organic. 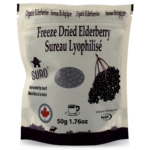 Freeze drying allows to keep all the benefits of this super fruit elderberry. Containing 2 to 3 times more antioxydants than blueberries and cranberries. Enjoy elderberries any day in smoothies, granola bars, cereals or any way you like! Take 1 tablespoon and make an elderberry tea or include in your favorite smoothies snack or eat as is. They are delicious end fluffy!